When exploring potential waiver wire additions, recent production and line combinations always come into play. In addition, dual-position flexibility is a wild card. On jam-packed game nights, it provides fantasy owners with the chance to fill as many roster spots as possible -- which can prove to be a significant edge in head-to-head leagues. 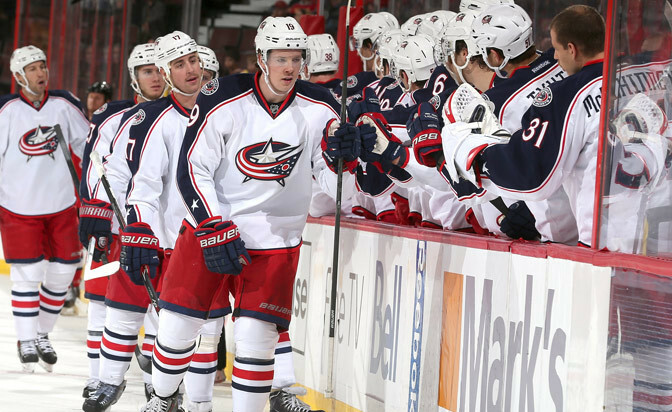 Columbus Blue Jackets forward Ryan Johansen, owned in 11 percent of Yahoo leagues, fits the bill in that regard. The 21-year-old, who has both center and right wing eligibility, picked up his fourth multi-point game of the season and had five shots on goal in Sunday's win against the Ottawa Senators. While his point production has been somewhat sporadic this season, he was able to earn top-line minutes alongside Brandon Dubinsky and Cam Atkinson prior to Marian Gaborik's injury. Now, with Gaborik out 4-6 weeks, the Blue Jackets can prioritize the development of Johansen, whom they selected with the fourth pick in the 2010 NHL Draft. Johansen has 13 points in 20 games this season and has tallied at least one shot on goal in all but one of those contests. While his rating (minus-6) has been suspect, his shots total (54) is second-best on the team behind only Atkinson (66). He also touches on hits (34) and penalty minutes (10) somewhat regularly and plays on Columbus' top power-play unit (2:39 power-play time on ice per game, 4 power-play points). The Blue Jackets have used Johansen in various roles to get him acclimated to the NHL level over the past two seasons, but indications early on this season are he is finally taking the next step toward becoming a featured offensive weapon. His point production (13) out of the gate in 2013-14 has already exceeded his 40-game output from last season (12) and he's in position to produce 50-plus points and 200-plus shots by season's end. He also has size (6-foot-3, 223 pounds) on his side in the offensive zone. So if you're in a deep and/or keeper league and have seen one of your right wing- or center-eligible players placed on injured reserve (Gaborik, Steven Stamkos, Brent Burns, Jeff Carter, etc. ), Johansen needs to be on your radar before he becomes more widely recognized.